This epic historical novel takes three brothers from the drought-stricken outback of Queensland to the horror of the trenches in World War One.They went to war and fought for love …Although Madeleine has grown up in the shadow of her grandfather, the renowned artist David Harrow, she knows little about him. For David died long before she was born, and his paintings sold off to save the family property, Sunset Ridge.Now, decades on, with the possibility of a retrospective of David’s work, Madeleine races to unravel the remarkable life of her grandfather, a veteran of the Great War, unaware that his legacy extends far beyond the boundaries of the family property…It’s 1916, and as Europe descends further into bloodshed, three Queensland brothers -Thaddeus, Luther and David Harrow – choose freedom over their restricted lives at Sunset Ridge. A ‘freedom’ that sees them bound for the hell of the trenches. With the world on fire around them, the brothers bear witness to both remarkable courage and shocking carnage. But they also come to understand the healing power of love – love for their comrades, love for each other, and love for the young, highly spirited girl they left back home…This is a story of bravery and misadventure, of intolerance and friendship, most of all it is the story of three young men who went to war and fought for love. 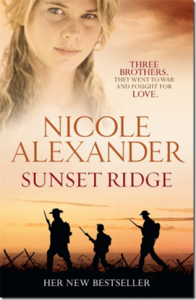 Sunset Ridge is the first book by Nicole Alexander that I have read and it was most certainly a highly enjoyable read. The book is set in two different periods. The book opens in February 2000 as Madeleine heads to the family property to discuss the possibility of an exhibition of her grandfather’s art works. The book then goes back in time to 1916 where we meet the Chessy family in northern France. In chapter 4 we meet Madeleine’s family in 1916 and the dramas that lead to all three Harrow brothers heading overseas to northern France. The book then goes back and forth in time explaining what is happening to the Chessy family in France, the Harrow family in Queensland in 1916 and also in 2000. Sometimes when books have jumps in time they lose the plot but this was not the case. I thought it was a great portrayal of life at the front during World War I not only covering trench warfare, but also family life and conditions within local hospitals. You are introduced to many well drawn characters in the pages of the book. I really couldn’t put this down particularly during the World War I descriptions as I wanted to know the fate of the Chessy and Harrow brothers. I will most definitely be reading more Nicole Alexander. This entry was posted in Australia, Reading and tagged books, Nicole Alexander by Cathy Powell. Bookmark the permalink.